Daily Mirror - Who’s responsible for ‘Alternative Facts’ on tobacco taxation? Who’s responsible for ‘Alternative Facts’ on tobacco taxation? The term ‘Alternative Facts’ has come to describe ‘blatant falsehoods’ spread to the media by those in power who purposely create doubt about even obvious and easily verifiable facts. Over the last few months, the Sri Lankan government’s tax increase on cigarettes has been subject to a sustained campaign of such ‘Alternative Facts’. The WHO commemorated ‘World No Tobacco Day’ yesterday (31st May). Its theme for 2017 is ‘Tobacco- A Threat to Development’. Development is more than prosperity and good health. It is also being free of manipulation and deception. In the case of cigarettes, development is undermined not only through the well documented harm to health and the economy. It is also undermined through the subversion of the media to mislead people and policy makers with ‘Alternative Facts’. The British born American comedian John Oliver has an informative episode of his show ‘Last Week Tonight’ (15 February 2015) that highlights the mendacity of the tobacco industry on a global scale. This Insight focuses on Sri Lanka and evaluates three patently false claims that were spread in the local media after the cigarette tax and price increasessince October/November 2016. Without citing any published sources, multiple reports in the media have claimed that government revenue has dropped due to the increased tax on cigarettes. Claims for 2016: Some media articles claimed that the government has lost Rs.10 billion in revenue in 2016 due to the tax increase. This can be easily checked. For 2016, the Central Bank report shows that the revenue from excise taxes alone (not even counting the VAT revenue) increased by Rs.8.7 billion; and it also exceeded what was anticipated by the budget estimates for that year. See Table 1. Prognosis for 2017: There is a large body of academic literature on consumer response to tobacco taxation, and plenty of data – specifically on Sri Lanka – which tells us that consumers tend to reduce consumption by a lower percentage than the percentage of the price increase. In the jargon of economists, the price elasticity of demand is less than 1. In such a context, price/tax increases will necessarily increase revenue— because the loss in revenue from reduced sales is more than offset by the increased price. For the two cigarette brands that account for more than 90 percent of sales in Sri Lanka, the tax charged by the government increased by about 46 percent as a weighted average (through increasing the excise tax and reintroducing VAT in November 2016). The Ceylon Tobacco Company (CTC) responded by increasing price not only to recover the increased tax, but also to additionally increase its own net-of-tax revenue per cigarette. The numbers are in Table 2. If the price elasticity of demand was close to 1, there could be a revenue reduction. In 2015, total sales of cigarette sticks arerecorded as being above Rs.3.9 billion and in 2016 it is recorded as being above Rs.3.7 billion. For government revenue to fall, cigarette consumption should fall below Rs.2.5 billion in 2017, or there should be a very large consumer substitution from the most sold brand of cigarettes to the cheapest brand of the same company. Neither of this is the case. The data from Sri Lanka customs for the first three months of 2017 points to sales exceedingthe revenue neutral level of Rs.2.5 billion in 2017 and even approaching the Rs.3 billion mark. It also shows that the proportion of sales of the lowest price brand, relative to the premium brands, has not seen a large increase.This makes it mathematically impossible for the government to earn less revenue in 2017 from the increase in taxation. At least 10 articles in the mainstream Sinhala and English press, since October 2016, carried the view that there is a strong substitution of consumption away from cigarettes to beedi ‘due to increasing cigarette taxes’. However, no substantive basis has been provided for these claims that are being drilled in by repetition. Sri Lanka does not collect consumption data on beedi. 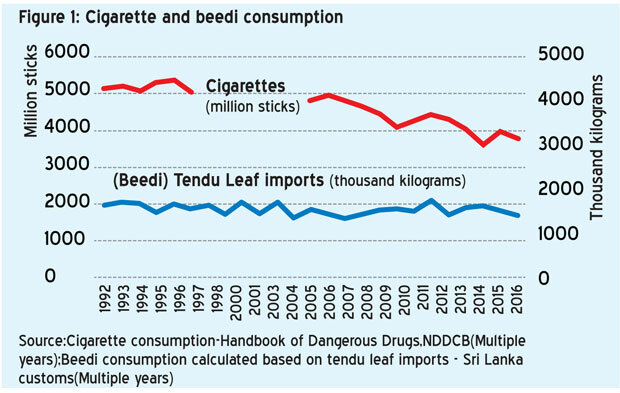 Therefore, beedi consumption is normally estimated by the quantity of tendu leaf imported to the country, as this leaf is unavailable in Sri Lanka. This is a special leaf that forms the ‘paper’, which is rolled up with shards of tobacco inside to make the beedi stick. Figure 1 provides Sri Lanka’s import data for tendu leaf. It shows that tendu leaf imports have been fluctuating but ebbing downwards over the last 25 years, while cigarette consumption has declined by over 20 percent. In the annual report of CTC in 2015, the CEO’s statement asserts a trend of ‘beedi consumers [returning] to cigarettes’. Even though the lack adequate survey data means it’s not possible to assess beedi consumption with confidence, this observation of the CTC CEO in 2015 is not inconsistent with the top-level data.However, the opposite claims in the media, that consumers are switching from cigarettes to beedi, is not supported by the top-level data. The substitution to watch: There are several cigarette brands. The premium brandsare more than twice the price of the lowest priced brand produced by the same company. The premium brands accounts for over 87 percent market share at present. In this market context, it is illogical to expect that consumers would switch from the premium brand to beedi, instead of to the lower priced brands. Therefore, in protecting government revenue, this is the substitution to watch. Mitigating this loss requires the government to pursue higher increasesin the taxes/pricesof the lower priced brands to reduce the price/tax gap. This is also the advice provided by the WHO and the International Framework Convention on Tobacco Control, to which Sri Lanka is a signatory. Once again, numerous articles in the media that carried this view had not bothered to fact check arguments that were being provided by interested parties. Production is high: Cigarette production remains high and has dipped by less than 5 percent from 2015 to 2016. The total production in 2016 is still almost 5 percent higher than the production in 2014. The numbers are given in Table 3. Profits are climbing: The profitability of the cigarette industry in Sri Lanka has kept climbing while the media story presents the industry as being the victim. CTC does not increase prices merely to recover the increasesin government tax. It increases prices to gain higher net-of-tax revenue for itself. Thisjustifies the policy assessment that there is plenty of room for even further price increases. The increase in the net of tax prices and CTCs profits are shown in Table 3. 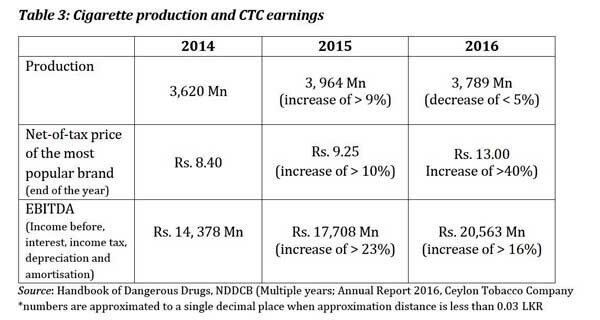 2017 prognosis: The increase that CTC has made on its net-of-tax revenue is high enough that even if local sales fall by 1 billion sticks from 3.79 billion stick sin 2016, CTC will still earn more in net revenue that it did in 2015. Alternative Facts – Who is responsible? The uncheckable nature of the sources,as well as the lack of by-lines in articles touting these false claims,makes it difficult to know who is responsible for generating these articles that are designed to mislead and confuse the public and policy-makers in the country. There is legislation banning the advertising of tobacco products in Sri Lanka. However, it is not clear whether interested parties are able to place articles masquerading as ‘news’ or ‘opinion columns’through intermediaries in the advertising and public relationsindustry. In a recent press conference at the Government’s Information Department, ADIC, an anti-tobacco campaign organisation implied that they were privy to such schemes. There is no definite information on who is responsible for the spate of falsehoods in the media on tobacco taxation.However, responsible media outlets, editors and the Sri Lanka Press Complaints Commission have an important role to play. Democracy does not work if the media becomes a conduit for ‘Alternative Facts’.